Week 3 - "Balance on the Nose"
Happy Flashy Friday!! This week's challenge was to balance a treat on your pups nose, it's taken some doing and Ziva still isn't convinced this is the trick for her. But we did it! Grab a bunch of treats before you start! 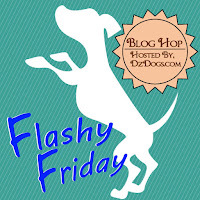 Begin by asking your dog to sit or lay down, this trick worked best for Dante sitting and Ziva flat on her belly. I began by asking Dante to "wait". Then using my right hand I would cup his chin, and place the treat from my left hand high up on the bridge of his nose - almost between his eyes! Quickly let go and say, "ok!" Ziva thought having a treat on her face was super weird at first, we had her lay down because she kept shrinking down to the floor anyways. Keep doing this 4 - 5 times and take a break. 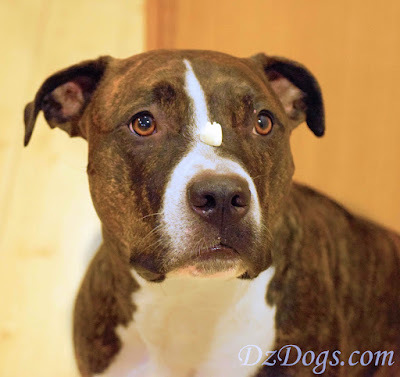 If your pup is having a hard time understanding to keep their chin up - Ziva kept dropping it. 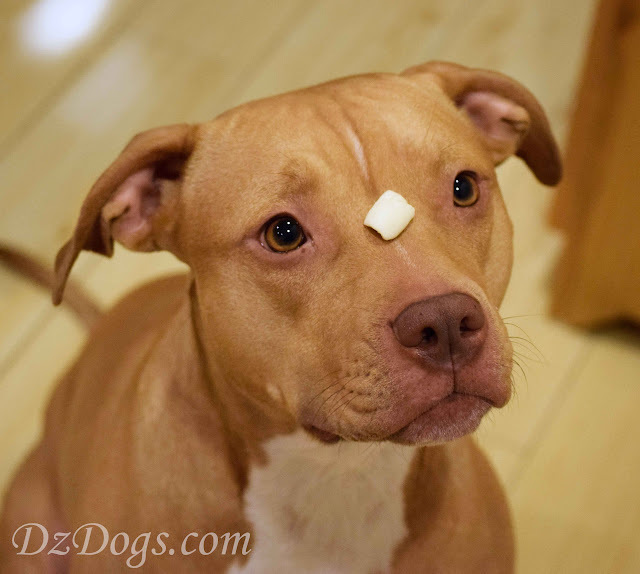 Use your second treat to give them something to look at, hold it right in front of their nose, ask for "wait", balance the treat, click or say "yes" and reward with the treat you were holding in front of them! It's very important that while teaching this trick you only ask your dog to balance the object for just a few seconds to start, gradually and slowly increasing the time at your dogs individual pace. A second to you can feel like FOREVER for your dog especially if it's their favorite treat! Always remember to give your release word! We say, "ok!" at my house - this lets your dog know when they can move. Remember this should be fun for everyone!! Watch your dog for signs of stress or frustration, if they are stressed - STOP! If your dog hates the trick it doesn't mean it can't be taught, however you may need to take longer breaks in between sessions or increase the value of the treat. Keep practicing your tricks! To make older tricks harder you can ask for longer duration's, and begin adding in distance. 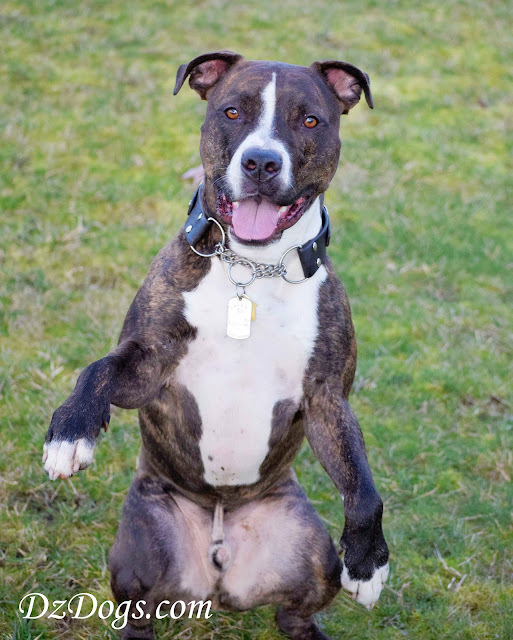 For example, asking for a "sit" or a "beg" from across the room from your dog. Week 4 Challenge - "Take It" hold an object in their mouth. I've always thought it would be fun to have the dogs help me carry the cloth grocery bags into the house, step one is teaching them to hold random objects for me! So here we go! Ha - I've tried this with Jack - he keeps reaching back to take the treat...I gave up after awhile. LOL! My dogs think balancing things on their noses is cruel and unusual punishment. They are not fond of it so we don't do it much. Great job! I've never been able to do this with Nola - this is really the ONLY thing she's uncomfortable with. Plus, her nose is too narrow! Those are great pictures of the treats on your pups' noses!! Buzz does good with it, but Missy's not a fan. Her take is that scrumptious treats shouldn't be "played with", but devoured promptly ;-) Giving a command from across the room definitely ups the ante - I've been wanting to work on that, so thanks for the reminder! !